0,25% solution for laboratory use. Used as digestive agent in cell culture preparation. 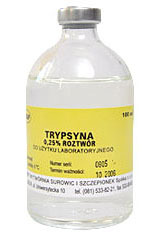 Trypsin does not lose its digestive activity after multiple freezing and defrosting. Sterilised through filtration. Control test of trypsin solution include sterility, pH (7.1 ± 0.2), osmolarity (270-300 mOsmol/l), digestive activity on continuous cell culture.